Churches Together in North Shields once again organised joint evening services in August this year, with a variety of inspiring themes. It was good to meet up with friends from other churches, to swell our numbers, and give our preachers a break over the summer. On 2 August, we were at North Shields Methodist Church, where Revd Jona Sewell encouraged us to offer both our best efforts and our failures to God, to recognise our weaknesses and our need of God’s help in serving God. On 9 August, at North Shields Salvation Army Citadel, Major Eric Pearce led a service of praise and testimonies about Jesus and our faith stories. On 16 August, we met at Christ Church, where curate Yvonne Greener and reader Margaret Brockbank spoke of the hospitality of God, and our own attitudes to welcoming strangers. On 23 August, at St Columba’s United Reformed Church, Revd Liz Blair urged us to make visible our unity in Christ, and by living in love to bring glory to God, and Christian witness to our community. On 30 August, we came together at North Shields Baptist Church, where Revd Lis Edwards took us on a virtual tour of the town, as we prayed for our community, and recognised its need to hear the good news of Jesus. We also acknowledged the difficulties we sometimes find in meeting tangible needs. Messy Church returned to St Columba’s this Easter. Good Friday began with an open air service organised by Churches Together in North Shields in Northumberland Square in front of the church. In spite of the cold and occasional snow flurries (which even led one speaker to wish us all a happy Christmas! ), a good crowd gathered in the centre of the square for worship and brief greetings from the MP for Tynemouth and the Deputy Mayor for North Tyneside. In addition to a couple of Easter hymns and a prayer, a short passion play was acted out in first century costume (which must have been very cold for the participants). A procession of witness followed through the town centre, stopping for a Bible reading and another hymn in the middle of Bedford Street shoppers. Services were then held in various churches around the town. St Columba’s provided an all-age take on Easter with a session of Messy Church. We began all together to watch puppets singing “Stay close to me”, and then went into the church hall where various activities were offered. Each of these provided a different say of thinking about Easter through doing. These included bracelet-making, playdough, word puzzles, making a floral Easter garden, or woolly lambs, or mini egg nests. 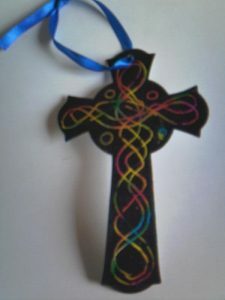 In one activity, participants were given a black cross, to represent the sadness of Good Friday, on which they could etch out a pattern through to multicolours below the black, for Easter joy. 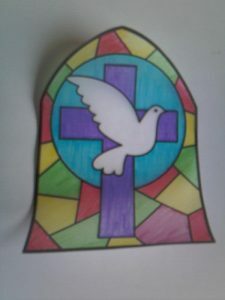 In another, we coloured in stained glass windows with felt pens on transparent paper, which we could then hold up to see the light shining through, remembering that Jesus is the light of the world. For over an hour the hall was full of young and older people happily absorbed in these activities, and moving round when they had finished each one. We hope to run Messy Church again at Pentecost.